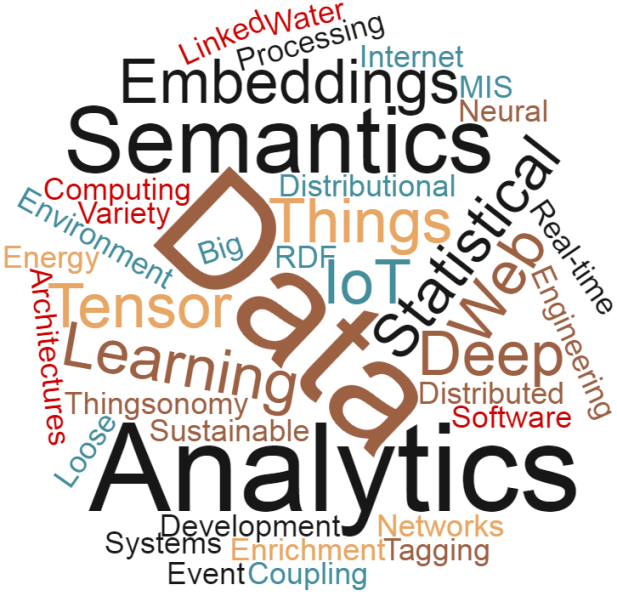 My research vision aims to make data self-explanatory with embedded meaning rather than with externally defined semantics, so machines as well as human software agents can exchange data without semantic barriers. That will be the enabler for truly open information systems on the Web and in the Internet of Things. I employ a wide array of methods ranging from pure mathematics, through engineering and computer science, and to the social sciences. Bio: I am a lecturer in information systems at Maynooth University, with research interests in data analytics, machine learning, word semantic embeddings, internet of things, and management information systems. I previously was an adjunct lecturer, and postodoctoral researcher in the Insight Centre for Data Analytics, and the Lero Software Research Centre, at the National University of Ireland, Galway. I earned a PhD in Computer Science from the National University of Ireland, Galway. 2008 – 2009 Coach of Damascus University teams. The 33rd and 34th ACM International Collegiate Programming Contest (ICPC), Arab and North Africa Region. Alexandria, Egypt. 2016 – 2017 Dell / LERO Smart City Research Programme. The main goal of the Smart City Sustainability Ecosystems work package is to design and evaluate a unified open data and IoT infrastructure for urban mobility systems. 2015 – 2017 Waternomics. The Waternomics EU project aims to reduce water consumption of municipalities, corporations and domestic users by providing water managers and consumers with timely information about water usage and water availability. The project makes information about the water services system available to stakeholders in real-time in order to stimulate water saving. By employing smart water technology, the project (i) enables the detailed and real-time measurement of water flows and usage, (ii) supports analyses of water consumption patterns and (iii) provides key recommendations on how to increase water efficiency. 2013 – 2014 SENSE. SENSE was a research and innovation project funded by Enterprise Ireland and Schneider Electric investigating an energy management system for small commercial buildings. SENSE empowered building occupants to actively engage in energy saving. Using modern sensor technologies, SENSE was able to identify energy waste problems occurring within a building in real-time and recommended solutions specific to the environment.By providing detailed feedback and analysis about energy use, SENSE increased awareness of energy conservation and encouraged behaviour change. 2010 – 2012 DERI Energy & Sustainable DERI. DERI Energy and Sustainable DERI were projects of the Green and Sustainable IT unit at the Digital Enterprise Research Institute (DERI). The projects targeted the data integration for green IT, and energy management within small and medium-size buildings using sensors and semantic web technologies. 2016 Souleiman Hasan, “Big Data Analytics; Artificial Intelligence and the Internet of Things”, Geodirectory Big Data Conference, Dublin, Ireland. 2015 Souleiman Hasan, “Dealing with Variety in the Internet of Things”, Big Data Analysis in Earth Sciences (EarthBiAs2015) Summer School, University of the Aegean, Rhodes, Greece. 2015 Souleiman Hasan and Edward Curry. Tutorial, “Tackling Large Scale Event Variety in the Internet of Things”, the ACM/IFIP/USENIX Middleware conference. 2016 Souleiman Hasan, “Distributional Semantics for Loose Coupling in IoT Architectures”, Insight SIG meeting on NLP, Insight, Galway, Ireland. 2015 Souleiman Hasan, “Big Data Technical Priorities”, International Workshop on Big Data Standards: European Initiatives, DCU, Dublin, Ireland.